Unremarked in the news are the national security dangers in giving Russia an absolute monopoly on US crew launches to the space station (ISS) after the space shuttle program is scrapped and until the time private launch systems are available. After the final space shuttle mission, the US will be completely dependent upon Russian launches to the station, opening up the US to potential extortion by an increasingly aggressive Russia to demand concessions in US foreign, economic, trade and defense policies to continue providing launches. Russia has already taken advantage of their upcoming monopoly by doubling the price for launches. This is international cooperation? Who would rule out any possibility of Russian 'leverage?' Suppose there is a foreign policy crisis, a war, or Russia invades a former USSR republic--what price in US policy might Moscow extract to keep launching our crew, or to even allow US crews to ever use the station again? Finally, the incident on July 2, 2010 where an unmanned Russian Progress cargo ship completely missed the space station (later it was brought under control and docked) shows technical risks which could endanger the space station. There are many ways the US and its ISS partner Russia can and should cooperate in space and with ISS, however it is unwise for the United States to rely entirely upon Russian launches for a period of years. Keeping the space shuttles in continued service (not just adding one or two final missions) until American replacements are ready is essential for our national security. 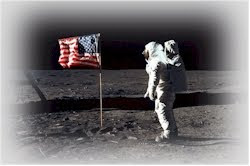 The 41st Anniversary of the Moon Landing!